with The Weiss Gallery, 2017. Roy Strong, Tudor & Jacobean Portraits, 1969, p. 167, pl. 328. Sir Henry Hobart (pronounced 'Hubbard'), was a classic Elizabethan ‘new man’, rising on his own merits to great wealth and influence at Court, famously involved in the Government's response to the 1605 Gunpowder Plot, and the problem of recusancy. Appointed as Chief Justice, he held positions as Chancellor in the household of the late Prince Henry, and then as Chancellor and Keeper of the Seal to Prince Charles I by 1617. As well as commissioning royal portraits, Hobart had his own likeness painted several times. Our portrait is listed by Sir Roy Strong in Tudor and Jacobean Portraits (op. cit. ), as the earliest example of Hobart’s iconography, by an ‘Unknown Hand’, dating to circa 1610. However, the panting was recently restored to reveal the date 1616, which significantly was the year Sir Henry famously purchased and began the transformation of the neglected Blickling estate in Norfolk – a dilapidated mansion which he had bought from Lady Agnes Clere for £5,500 plus annuity. He commissioned the renowned architect Robert Lyminge to re-build Blickling Hall and today it is a significant National Trust property. Blickling was designed in the high Jacobean style that Lyminge had used some twelve years earlier in his construction of Hatfield House for Robert Cecil, 1st Earl of Salisbury, with whom Hobart was closely aligned, and inevitably influenced. Both Hatfield House and Blickling Hall represent the crowning achievements of that period, even as a new era of Baroque design took root. Furthermore, both Hobart and Cecil commissioned the artist John de Critz to paint their portraits. Although the present work is somewhat crisper in line, and less obviously painterly in handling than one would expect from de Critz, it would almost certainly have been painted by an artist in his close circle. Born circa 1554 to Thomas Hobart of Plumstead, and Audrey Hare of Beeston, his great-grandfather, Sir James Hobart had served as Attorney-General and Privy Councillor to Henry VII. As the second son, Henry pursued a career in the law, attending Peterhouse, Cambridge and entering Lincoln's Inn in 1576. He was called to the Bar in 1584 and appointed Recorder of Great Yarmouth and Steward of City of Norwich, representing both boroughs in Parliament. In 1590 he married Dorothy Bell (d. 1641), daughter of Sir Robert Bell of Beaupre Hall, Outwell in Norfolk, Chief Baron of the Exchequer under Elizabeth I and they went on to have an extensive family of twelve sons and four daughters. Sir Henry was knighted on 23 July 1603 at the Coronation of King James I, and appointed Serjeant-at-Law the same year. Thanks to the patronage of Robert Cecil, 1st Earl of Salisbury, in 1605 he was given the lucrative post Attorney of Court of Wards. As a staunch Defender of the King's prerogative in debates on purveyance and impositions, he endeavoured ‘as evenly as I can, to walk between the King's right and the people's freedom’, and was heavily involved in clarifying the legal implications of Union with Scotland. 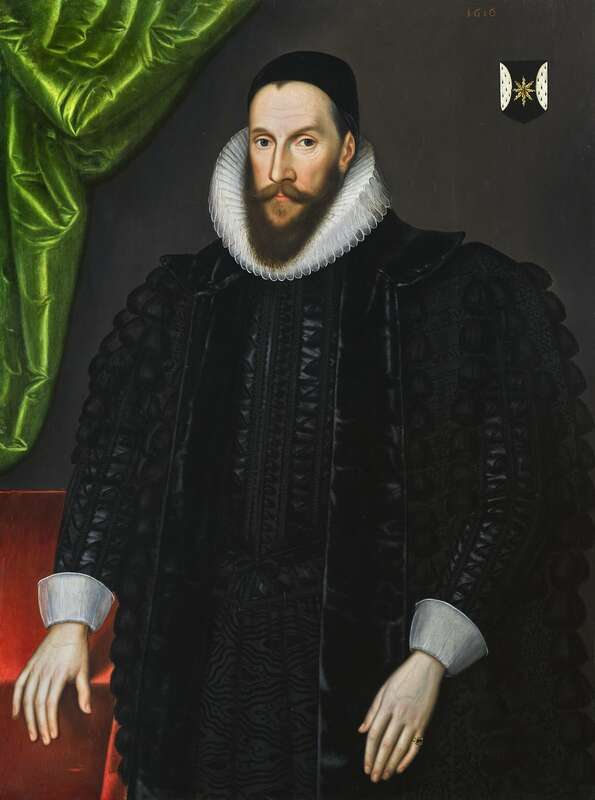 Hobart was appointed Attorney General in 1606 in succession to Sir Edward Coke, another great jurist of Norfolk extraction. His appointment blocked Sir Francis Bacon, incurring long-lasting hostility. Bacon jealously observed that ‘nibbling solemnly, he distinguishes but apprehends not... [he has] no gift with his pen in proclamations and the like.’ Hobart’s influence at Court was reflected in the baronetcy bestowed on him in 1611. He served briefly as Chancellor to Henry Frederick, Prince of Wales, before the Prince’s shocking early death from typhoid on 6 November 1612 and was appointed Lord Chief Justice of the Common Pleas in 1613, again in succession to Coke, and Chancellor and Keeper of the Seal to Henry’s younger brother Prince Charles, from 3 April 1617. Hobart accumulated extensive wealth during course of long career, with his annual income exceeding £8,000 by the 1620s. He spent approximately £55,000 over thirty years on purchase of landed estates, primarily in Norfolk. He was a canny investor with an eye for agricultural improvement, also evident in his re-organisation of Crown estates and the Duchy of Cornwall. He was also a member of, and investor in, the Virginia Company, the North West Passage Company and the East India Company. Notably, his younger son Robert emigrated c. 1645 to Jamestown, Virginia, depleted by the Anglo-Powhatan wars, and rose to prominence in the Colony. Sir Henry died on 26 December 1625, before the construction of Blickling Hall was complete. He was and buried in Blickling church, and following his death, his Norfolk neighbour Sir Henry Spelman lamented it as ‘a great loss to the commonweal’. His relation by marriage, Henry Finch, 1st Earl of Nottingham, , 1st Earl of Nottingham, later edited and published the legal notes Hobart had compiled for his own use as ‘The Reports of that Learned Sir Henry Hobart Knight etc’. We are grateful to Dr. Richard Grigson for his assistance with this entry. Roy Strong suggests that other portraits of Hobart dating from circa 1620 were painted by de Critz (engraved by Simon van de Passe), with a third type by Daniel Mytens at Blickling Hall, dateable to 1624. Payment record survives for sitting to Mytens on 22 December 1624, shortly after he granted him a lease on house in St Martin's Lane on instruction of Prince Charles. His wife’s niece, Frances, daughter of Sir Edward Bell and wife of Heneage Finch (one of Sir Henry’s three executors), was the mother of Henry Finch.